Organize The Story of Your Life With This E-Book!
. . . .WITHOUT LOSING YOUR MIND! Are You Overwhelmed By Your Photographs and Memorabilia? Have you got years and years’ worth of photos that have never even made it out of the film developers’ envelopes? Do you have old magnetic photo albums that are turning yellow and damaging your photographs? Are you up to your eyeballs in shoeboxes and stashes of photos that are a jumbled mess? Wondering how you’ll ever manage to organize the old photos you’ve inherited when you’re already frazzled by your own collection? Do you have piles of memorabilia and newspaper articles you want to save but don't know how to safely store? Feeling frustrated by rummaging through your piles in search of a special photograph only to come up empty handed? Have you slowed down or even stopped your picture taking because you just don't know where you'd put any more photos? 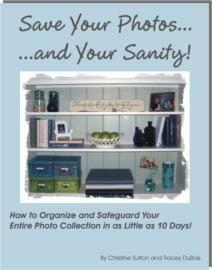 Are you fed up with feeling overwhelmed and guilty about your out-of-control photo collection? Sometimes you need a strong dose of motivation, or even just a little bit of support. That’s why we created Save Your Photos and Your Sanity™, a step-by-step plan for organizing and protecting your entire photo collection in as little as 10 days . . . without losing your mind! We knew there were so many people out there like us that were overwhelmed with the “seemingly monumental” (o.k. make that “monumental”) task of organizing their photographs. It’s just too big of a job to go it alone. We all need support, encouragement, and even just the sense that we’re not alone in our struggle. So getting back to that confession thing . . . We needed Save Your Photos and Your Sanity™ as much as you do! We poured ourselves into creating the most comprehensive and fun program possible, and just like you, we try to follow that advice! We tell you this not so that you’ll wonder whether or not we’re really qualified to help you, but so that you’ll realize that in our imperfection, we are perfectly qualified to help you. What could we truly offer you if organizing photographs came easily to us? How could we possibly relate to your needs if we could organize photographs as easily as we could breathe? We understand you, because we are “you”. We’re real people who, until recently, felt overwhelmed by the task of organizing our massive photo collections. We found some answers because we needed answers. We dedicated two years to uncovering every tip, every secret, every possible method for simplifying the process of organizing and preserving our precious photographs and memories. And after writing Save Your Photos and Your Sanity™ and following our own helpful advice ;-), we can proudly report that our not-so-perfect photo collections are finally organized! Not perfectly organized, but very reasonably organized, and we were able to accomplish this, once and for all, by following the guidelines outlined in the book. Our photo collections may not be “perfect” but they are safely organized in a way that makes sense to us. Finally, we are enjoying the peace of mind that comes from knowing that we’ve protected our family’s most prized possessions. We’re thrilled to share what we’ve learned so that you too can get your photos organized once and for all, and so that you can enjoy this same peace of mind. Save Your Photos and Your Sanity™ is more than a book, it’s more like a step-by-step course, and it’s delivered electronically right to your computer so you can get started right away! Learn why your procrastination--and even your attempts at organizing--may be destroying your precious photographs! It goes without saying that your inaction may be destroying your precious photographs, but would you believe that your attempts at organizing might actually be accelerating the deterioration of your photographs? Storing photos in manila envelopes or unsafe photo boxes. Using plastic baggies, or standard index cards to separate photographs. Using self-stick notes on top of photographs to keep track of memories. Using a ball-point pen to write dates and information on the back of your photograph. Storing photographs in their original photo-developing envelopes. Talk about unfairness! Who would ever imagine that your photos would not be safe in the very envelopes they come in? This photograph was stored in a standard photograph envelope, which was provided by the film developing company. Many photo enthusiasts rely on these envelopes to keep their photographs safe. This is a big mistake! This photograph has been discolored and damaged by the acid in the film envelope. The clear line of distinction indicates the placement of the photograph against the paper inside the envelope. Know the secrets to organizing photographs -- quickly and easily! Many people feel so overwhelmed by trying to organize their photos that they simply give up. For some people it gets so bad, that they actually stop taking pictures because they don’t want to add to the mess! Cut through all the scientific “mumbo jumbo” and make sure your photographs and negatives are safe! The scientific lingo and terminology of photo preservation get tossed around pretty casually. It may be casual to the “experts” using the terms, but it’s certainly not casual to the people trying to make sense out of them. There’s so much to sort out, and there’s so much to do, that it’s hard to even know where to begin. And making a mistake can cause you your precious photographs! The best places in your home for storing your photographs, and the 3 places you should absolutely avoid. What acid, lignin and PVC are and why they absolutely create havoc with your precious photographs. The 5 biggest mistakes that people make in handling their photographs. Are you making them? How to recognize and avoid the photo albums that will DESTROY your precious photos. The meanings behind all of the lingo (ie. archival vs. acid-free) so that you can be sure that the materials you buy will truly protect your precious photographs. You’ll know exactly which terms to trust and which to steer clear of. How to remove your photos from unsafe albums, without destroying them in the process! Discover the ONLY safe method for writing on the back of your photographs. How to handle your negatives – Do you even need to keep them, and if so, how should you organize them? This is just the tip of the iceberg! There’s so much more, we couldn’t possibly list it all here. And this is why we’re offering you our private collection of hundreds of tips and secrets on a completely risk free basis. I am happy to report that I finally downloaded "Save Your Sanity and Your Photos" a few days ago, printed it out, and read it in its entirety (not bad for someone who hates to read! ;-) Anyway, it was good, informative, light reading. Some information reiterated what I already knew, and I learned a lot I didn't know. I guess what makes me the most anxious is that I have "been here" before! You know, the point where you are determined to get your mammoth photo project underway. Something has always managed to get in the way, or fall through the cracks, and was put on the backburner. AGAIN! (Freud, where are you?!) I could really relate to the "Top 5 reasons people put off photo organization!" Especially the perfectionist and emotional factors. I will NOT let anything stand in my way this time. (My husband laughs at me when I say that!) I have established my "working area" and cleared out all the clutter to make it neat and approachable. I am not sure which "method" I will use yet. Probably a combination of the 3. The reason that I got stuck initially (when I stopped organizing photos into albums), which is the same reason that has prevented me from proceeding with this formidable project for the last 9 years, is deciding "HOW" I want to organize my photos. When my first child was born, it was easy. I made a "first year" photo album for him. Nothing fancy. No journal or scrapbooking. But it looks nice. I took the best of his first year photos and assembled them nicely into an album. Then came baby #2. I started his "first year" album and...guess what...that's right, I got stuck and stopped! Being the perfectionist that I am, I didn't know whether to put photos of just him in his "first year" album, or he and his brother (which I felt cheated son #2), or a combo of the 2. Then I battled with the decision on whether I wanted to have separate theme albums, such as "birthday album" for each child; christmas album; vacation album; etc. So this became my BRICK WALL! My oldest is now 10, middle is 9, and my daughter is 5. And to complicate things, I now have a combination of traditional photos and digital photos. And yes, digital photos that are just that... DIGITAL (another reason I could relate to your ebook!). Oh, have I mentioned that I have a closet full of photo albums, photo frames, frame samples, and scrapbooking supplies that remain in boxes!!! (My husband thinks I am OCD in regards to the "picture thing" LOL) Over the years I have purchased an array of products, in search of the "perfect" ones, only to end up with a bunch of stuff I have AVOIDED!! I am sure you have read my story a thousand times. But I tell you what...this is the first time I have ever written down all this...and now that I have...I feel a huge RELIEF!!! I am so thankful to have stumbled upon your website, and know that this is IT. You and Tracey have given me the inspiration, motivation, and tools to get moving with this project that has been hanging over my head for years!! Thank you so much, and I look forward to more interaction with you guys!! If you’re thinking that this e-book is going to be some dreadfully boring read, stuffed with scientific ramblings on photo preservation and the finer points of creating meticulous organizational systems, then you can relax! Overcome the boredom – and actually have fun while organizing your pictures! Believe me, we understand that the process of organizing photographs can feel overwhelming, and the whole topic of photo safety can be rather dry. That’s why we use every technique we can think of to liven up the process. We do whatever it takes – stories, exercises, and plenty of humor – to make the process not just manageable but enjoyable! And, as far as meticulous organizational systems, if that’s what you’re looking for, then you should probably not count on us. We’re not interested in creating perfect photo libraries that must be rigidly maintained. 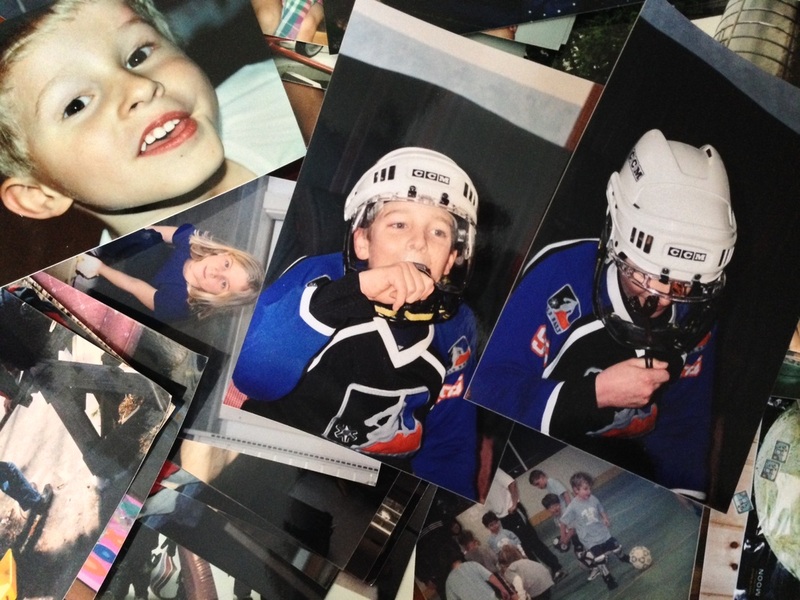 Our goal is to help you arrange your photographs in a way that works for you! The bottom line is making sure that you can get back to the photos when you want to, and ensuring that you’ll be able to enjoy your precious photographs for years and years to come. Arrange and display your photographs in a way that makes sense to you, so that you can truly enjoy them. There are lot of different options for organizing and displaying photographs. So many options, in fact, that it’s hard to know which methods are available, let alone which method to choose! How to decide if you should use photo boxes, photo albums or both. What to do if you’ve got lots of photographs and you have no desire to put them all into albums. What to do if you would like to get your pictures into albums, but you don’t want to spend a lot of time doing it. What you MUST know before you frame your photographs for display. How to know whether you should separate your photos by each family member or if you should keep them all together. How to turn an empty wall into a treasure by creating your very own photo gallery collage. We’ll walk you step-by-step through the process. What scrapbooking is and whether or not it’s right for you. Make sure that you’ll always have the memories that give your photos their meaning. Simple ideas for capturing the memories that accompany your photographs, so that you’ll always be sure to have the memories that give your photos meaning. The number one thing that people do in an attempt to record their memories, and why it’s absolutely a big mistake. Why scrapbooking is taking America by storm, and how you can get in on the fun. Which details you MUST include if you want anyone to care about your precious pictures. How to journal so that your “audience” will be enlightened – not bored stiff. Why most people are intimidated by journaling and what you can do to overcome this challenge. What to do if you have absolutely no interest in scrapbooking but you still want to capture your memories. The simple, no-fail test to determine whether or not you’ve done a good job in recording your family’s memories. How to choose the right supplies – which ones will be safe and which ones will be the best match for your personal style. If you’ve strolled down the craft aisles of your local department store lately, then you know that there are seemingly endless possibilities of supplies. When it comes to organizing photos and recording memories, there is a dizzying array of supplies to choose from. And with the unprecedented explosion of the scrapbooking market, there are unfortunately, some unscrupulous companies jumping on the bandwagon. So how can you tell which products to trust? And how do you even begin to know which types of supplies will be best for you? What you MUST know before purchasing supplies. How to do determine which markers are safe for your albums and photographs. Which albums you should entrust your precious photographs to and which you should stay away from – regardless of what the product labels say! The absolute easiest album to use if you plan to create a scrapbook. The two biggest pitfalls of using traditional photo boxes and how you can overcome them. How to care for your precious keepsakes and memorabilia. Your photographs tell only part of the story. What about all of those precious keepsakes, like certificates, diplomas, baby hair, hospital tags, report cards, and artwork? The list goes on and on —and so does the confusion about how to care for these precious items! As you’ve been reading about all of the helpful ideas you’re going to gain from the Save Your Photos and Your Sanity™ e-book, you’re probably wondering if you’ll really be able to implement the ideas. You may even have some doubts about whether or not you’ll be able to keep up with your newly organized photo collections. How to make the most of your limited time, so that you can easily organize your photos. 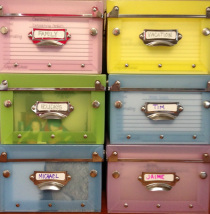 The simple habit that will make the difference on whether or not you stay organized! The secret solution that will help you organize those photos in minutes (and help you keep them organized)! Simple “tricks” to motivate yourself into taking action – even when you don’t feel like organizing photos. 15 things you can do in 15 minutes to make major progress in organizing your photographs. How to choose a film developing method that is right for you. We’ll show you all the options so that you can find the one that works best for lifestyle and your needs. With this valuable information, you’ll finally have all the answers you need to be able to conquer your piles of photographs--once and for all! You’ll enjoy the satisfaction and peace of mind of having your photos organized, but much more importantly, you’ll have the joy and pride of knowing that you’ve preserved your family’s memories for your loved ones to cherish. I have started to organize my years and years of photos. I got all the supplies I needed and have organized all my Dad and Mothers photos, and about 4 very large boxes of my personal photos. It is going very well. I work on the process a little each day and it has been a joy to go through all these wonderful years of memories and precious pictures and articles. You e-book has been a great source of inspiration for me and keeps me going. In the next few weeks the project will be complete. My heart feels a great sense of relief in doing this task, as I will soon celebrate my 70th birthday and 50th anniversary. Time is moving on and now my children will some day receive a very organized set of precious memories. Thank you so much! ... Then we think you're going to love what we’re going to do next. Super Bonus #1 – "How To Turn those Neglected Family Portraits into a Treasured Family Album – in Just One Afternoon!" We’ve all got them – those family portraits that we invested so much time and energy into. (Remember how hard it was to get each and every family member neatly dressed and happily smiling at the exact right time?) As parents, most of us get caught up in the moment, spend way too much money, and then spend a short amount of time admiring the results before we stick the photos in a closet somewhere, soon to be forgotten. We’ll show you how you can gather up all of those miscellaneous portraits and put them together in one beautiful album that your family can treasure for generations to come. Don’t worry -- You won’t need an art degree in order to pull this off. In fact, you don’t need any “experience” at all. We’ll walk you step by step through the entire process, and we’ll show you some deceivingly simple tricks to create a “showcase” album in just a couple of hours. This report alone is worth the price of the collection. And if you order right now, it’s yours free. Let’s face it; your photo collection will have so much more meaning if you’ve got good-looking pictures. It’s hard to get excited about looking through a photo album that’s filled with pictures that are fuzzy, dark or have trees growing out of someone’s head. This special report will teach you the little-known tips that will help you take better pictures so that you can have a more meaningful photo collection. Doesn’t it seem like the kids come though the door with stuff faster than you can possibly keep up with it? As parents, we need to maintain that fine balance between nurturing our children’s self esteem and keeping our own sanity! We’ll show you a way that you can eliminate the majority of the kids’ artwork without guilt and still watch their self-esteem soar! In this special bonus report, you’ll learn how to choose a few select pieces of your children’s artwork to create a mini-art gallery. Not only will you brighten up an area of your home with this simple project, but you’ll brighten your children’s faces as they beam with pride. As you begin the task of organizing your photographs, you may find that you have photos that aren't worthy of keeping but that you just can't bring yourself to throw away. In this special bonus report, we’ll walk you through a simple project that will help you release those photos without tossing them. With our help, you’ll learn how to use those unwanted double prints or old heritage photos to create one-of-a-kind cards that is sure to put a smile on the face of the recipient. Making the most of school portraits. Having documentation to go along with your CD of digital pictures. Being able to include journaling in even the simplest "slide-in" style photo albums. Capturing details and memories of your child's life -- without a lot of effort. It's taken us years to come up with all these tools. And they're yours free! We've done all the work for you. All you need to do is print and enjoy! We want you to have no doubts about ordering the Save Your Photos and Your Sanity™ e-book. That’s why this collection comes with a Risk-Free, 100% money-back guarantee. There’s absolutely NO RISK on your part. And, because you’re entrusting us with your time and confidence, we want you to keep the five Special Bonuses – free of charge – even if you return the collection. That’s a guaranteed gain no matter what you decide! One last word of caution . . . Please don’t take your chances with your family’s most prized possessions! Please follow through and take action on what you’ve just learned. Order your copy of Save Your Photos and Your Sanity™ today and ensure that your family stories will be cherished for generations to come. We look forward to getting a letter from you, telling us about how you’ve been able to conquer your piles of photographs! Even though we get an enormous amount of mail, please write to us. We’d love to hear your success story! PS. What have you got to lose? With our eight-week money back guarantee, absolutely nothing! If for any reason, you decide that Save Your Photos and Your Sanity™ does not dramatically improve your desire and your ability to help you conquer your piles of photographs, then we will refund your money, no questions asked! PPS. What do you stand to lose if you don’t give our Save Your Photos and Your Sanity™ a try? Perhaps the very items that you treasure most -- your precious photographs and memories . . . A legacy for your family to cherish. Please don’t let this happen to you! Click below to purchase "Save Your Photos AND Your Sanity"
"Save Your Photos and Your Sanity is a must-read if you're a photo saver, a scrapper or if you just don't know what to do with the years of accumulated pictures that haunt your basement and closets." “A few months ago, you suggested the resource, 'Save Your Photos and Your Sanity' in your newsletter. At the time, my photos were totally out of control, and when I saw your recommendation, I just had to have it. I'm very happy to say that because of this resource, my piles and boxes of photos that have been accumulating for the past 10 years, are completely and beautifully organized.
. . . I finally pushed myself to sort my photos... this is after years of procrastinating and searching for every excuse under the sun to not get started. It was perfectionism at its worst. I had read tons of stuff, asked for tips in chat rooms and purchased boxes & stuff to get it done. Your web site was my final stop.... You guy's got me to do it ! PS The feeling is as good as losing weight! I did get all of my photos sorted and marked and in envelopes a short time after I received your e-book, which, believe me was no small task!!! That was the most important and biggest job, and I am sooooooo happy about that. I would NEVER have been able to get accomplished as well without your e-book!!! If that is all I ever do, It is very much worth it. I am so grateful that I found your website. I have bought scrapbooking supplies since then started a scrapbook...Thank you again for your help, and it is really nice that you follow up with the e-mails, They help to keep me from just completely forgetting about it and they remind me that I really do want to get back to the task! I do save your monthly tips so I have them available for when I need a reminder of your good ideas. I organized my photos! I thought your book was great. It was exactly what I was looking for. A step-by-step process to get me going. You guys are great -- I'd be excited to read more of your work and more tips. Thanks! FEELING FRAZZLED BY YOUR PHOTOS?